Are you planning house renovations for the near future? If so, you’ll want an experienced remodeling contractor to handle your project. When you meet with a home remodeling contractor at Abode Building Center, you can feel free to ask questions so you can make the right hiring decision. Keep reading to learn what questions you should ask a remodeling contractor for kitchen remodels, bathroom renovations, and more. In the state of Michigan, you must be licensed to do home remodeling. Any home remodel contractor from Abode Building Center would be more than happy to provide you with a copy of their license as proof of their qualifications. Never hire a remodel contractor who is unwilling to prove they’re licensed. 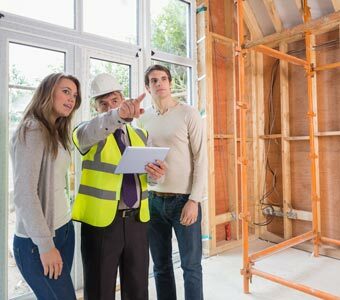 If you are planning a major home improvement project, you’ll want to make sure you hire someone who has the necessary experience and qualifications. We care about the safety of our workers, which is why we make sure they are protected with the proper insurance. Beware of remodeling companies that don’t provide workers’ compensation for their employees. If a worker is injured while working on your bathroom remodel, you don’t want to be liable for paying their medical expenses. If a company doesn’t want to share whether their employees are protected by insurance, walk away. A reputable renovation company takes care of their employees. Ask a home remodeling contractor for their references so you can get an idea of the quality of work they do. Having the contact information for their past client also gives you the opportunity to learn if the contractor acted professionally throughout the project. A remodeling contractor will be willing to give you references if you are seriously considering them for the job. Make sure you ask for references for projects that are similar to what you want to be done to your house. For example, if you are interested in a kitchen makeover, you’ll want to pick a contractor that has worked on kitchens in the past. Also, make sure that the contractor is prepared to handle the scale of the job you have in mind. If a contractor’s experience is limited to small bathroom remodels, they may not be the best person to handle a large renovation. Likewise, if you love the look of granite countertops, you’ll want to pick a contractor who has experience installing them. While this list is not meant to be inclusive of all the questions you could ask, it’s a good start. We also encourage homeowners to ask us questions during the remodeling process so they can be completely satisfied with their home’s new look. In other words, we are dedicated to making sure you are happy with your latest home remodel. The interior remodeling contractors at Abode Building Center are dedicated to helping you achieve the home of your dreams. If you are interested in our home remodeling services like kitchen renovation or bathroom makeovers, give us a call at (269) 329-1800.